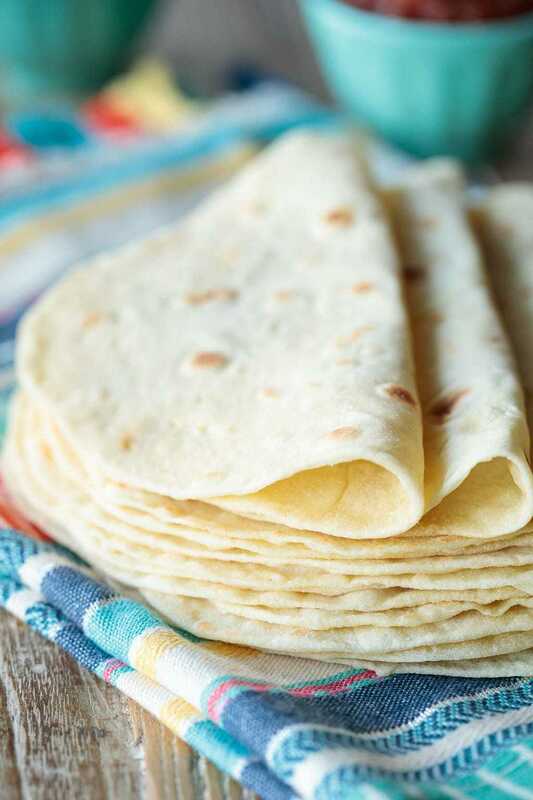 These really are the best ever homemade flour tortillas, no one can believe how easy and delicious they are! Over 300 5-star reviews! This recipe has been a long time in coming, years actually. I’ve been trying out recipes for homemade flour tortillas for what seems like forever – but I’ve never been thrilled with any of them. Definitely not thrilled enough to blog them – too dry, too sticky, too crisp, too bland, too soggy, too complicated. This time, with these flour tortillas, it’s different. 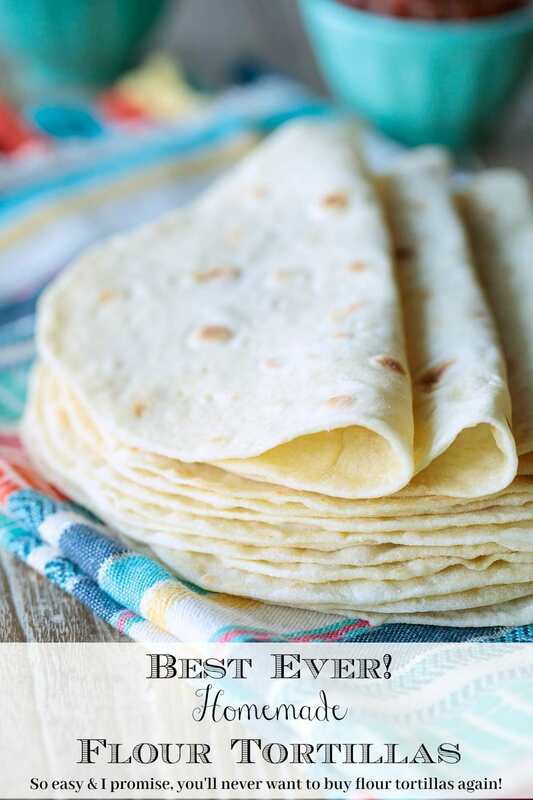 They totally live up to their name – Best Ever Homemade Flour Tortillas! I LOVE the results, and I think you will too. These homemade flour tortillas are tender, soft and flavorful. Because they keep well, they can be made in advance and warmed in the microwave or on the stovetop, just before serving. 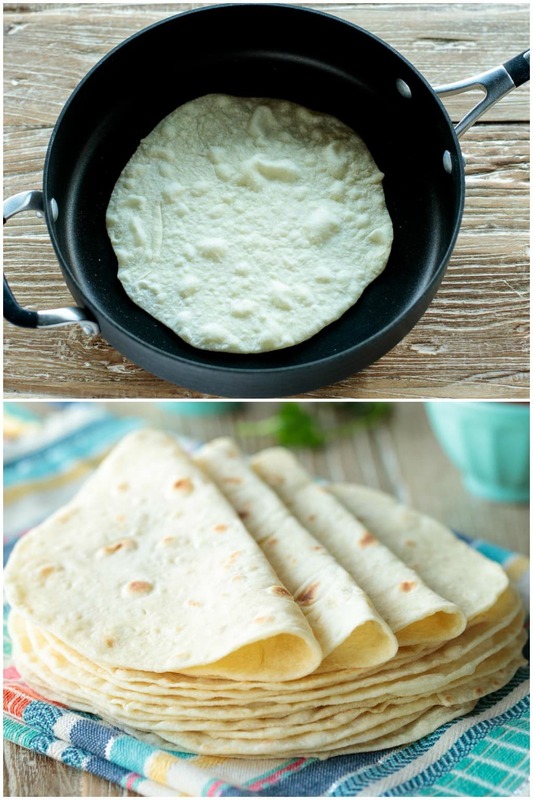 How to make flour tortillas from scratch – easier than you think! They’re also EASY, super easy! If you have a mixer with a dough hook, you can have the dough made in less than five minutes. You can also easily mix it together without a mixer (using a wooden spoon, sturdy spatula or Danish whisk), which is the way I usually make it. But whether you use a mixer or not, it’s super important to give the dough a little rest after mixing. This helps relax the glutens, in order to make rolling the tortillas much easier. These flour tortillas will make any South-of-the-Border meal extraordinary. Burritos, enchiladas, tacos, quesadillas … it all tastes better! But this is the REALLY cool thing; they also make fabulous, super thin crust pizzas. Just brush them lightly with olive oil and top with your favorite pizza ingredients. I love pesto, a bit of fresh mozzarella, smokey bacon bits and a sprinkle of pine nuts and/or fresh herbs. Pop them in a piping hot (450˚F) oven for 4-5 minutes or until crispy golden brown. Imagine coming home after a busy day and having a stash of these tortillas (aka pizza crusts) in the freezer. Throw together a fresh salad and an individual pizza for each family member and they’ll be “WOWING” you all evening long! 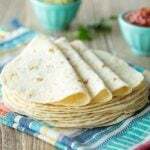 I’ve used these homemade flour tortillas for wonderful sandwich wraps. It’s fun to spread them with a bit of butter and a sprinkle of cinnamon sugar for a quick sweet treat. They make fabulous, shatteringly crisp chips too. Just brush one with a teaspoon of olive oil on both sides, then sprinkle lightly with kosher salt. Bake for 5 minutes at 450˚F. and you won’t even believe how delicious they are on their own or broken into irregular pieces and used to dip hummus, salsa etc. Can you tell I’m excited about these guys? You will be too and I have a feeling, once you try them, you won’t want to be without a cache of these tortillas in your freezer. They’re almost too good to be true! Almost. The recipe calls for using a stand mixer, but you can also make them by hand. Just mix up the dough in a medium size bowl with a wooden spoon or sturdy spatula. Then turn the dough out onto a lightly floured work surface. Knead the dough until it’s nice and smooth (about 2 to 3 minutes) and then proceed as directed in step 3 below. Roll the tortillas pretty thin. You want them to look almost translucent if you held them up to the light. Thick tortillas won’t be tender. If you try rolling out these tortillas and the dough keeps shrinking back, let it rest for another 15-30 minutes. The gluten just hasn’t had enough time to relax. I’ve also used olive oil for this tortilla recipe with good results. If you use coconut or peanut oil the tortillas will take on a bit of the oil’s flavor. 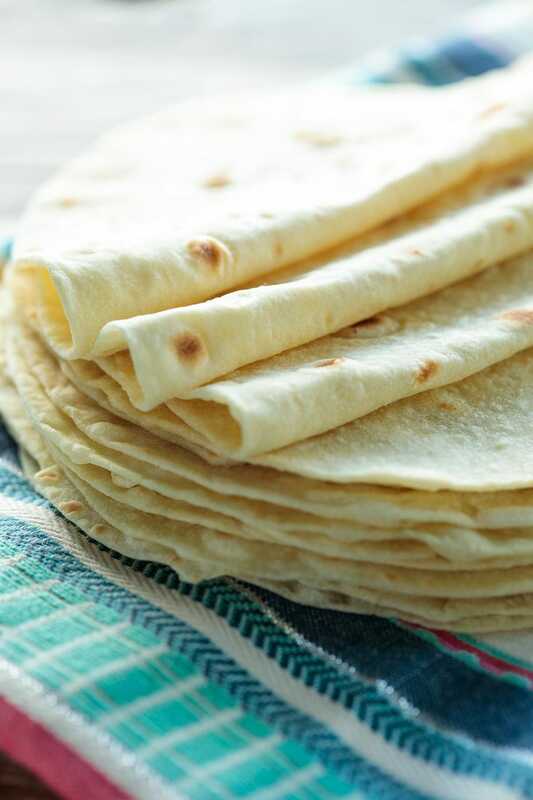 If your tortillas feel stiff after cooking, you’ve cooked them too long or the heat was too high. Cook them only long enough to get some nice bubbles on the surface and a few light brown spots on the underside. Then flip them for another 15-20 seconds. A tortilla warmer is a nice accessory to have when making tortillas, as you can stack tortillas after cooking to keep them soft. It’s also perfect for serving the tortillas at the table. It’s not necessary to have one though. Just use a pot with a cover that’s slightly bigger than the tortillas. Place each tortilla in the pot after removing from the pan and cover with the lid. The steam from the just cooked tortillas will keep them all soft and pliable – same way a tortilla warmer works! Readers have asked if it’s worth it to have a tortilla press. I honestly don’t think it’s necessary for these flour tortillas, as they’re easy to roll out. Wipe out the pan in between tortillas with a damp paper towel if flour is starting to accumulate. Note: This recipe was originally published back in August of 2013. The photos were terrible but in spite of that, this recipe is by far, the most popular recipe on the blog. It has over 1100 comments and over 700 5-star reviews. I’ve gotten emails from people all over the world who have made and loved them. We’ve re-taken the photos and tweaked the post a bit. Make them! I think you’ll love them too! Do enjoy South-of-the-Border cuisine? 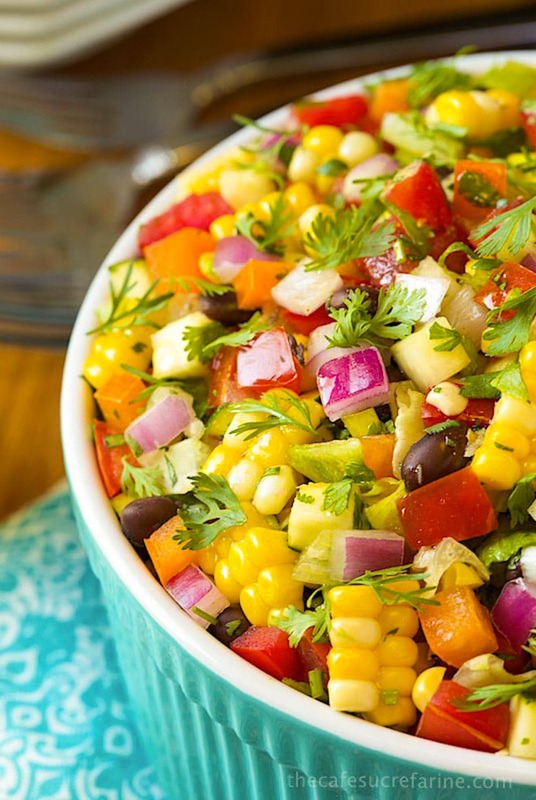 If so, be sure to check out our Mexican Chopped Salad. It’s another super popular recipe on The Café. It’s fantastic with just about any Mexican or Tex-Mex entree. Pair it with these Best Ever Homemade Flour Tortillas for a meal that’s sure to bring rave reviews! If you enjoy this recipe, please come back and leave a rating and review! It’s so helpful to other readers to hear other’s results and ideas for variations. These Best Ever Homemade Flour Tortillas are so simple and unbelievably delicious! Combine flour, salt and baking powder in the bowl of a stand mixer. Using the dough hook, mix dry ingredients until well combined. Add oil and water with mixer running at a medium speed. After about 1 minute, or when mixture comes together and begins to form a ball, decrease mixing speed to low. Continue to mix for 1 minute or until dough is smooth. Transfer dough to a lightly floured work surface. Divide into 16 equal portions. Turn each piece to coat with flour. Form each piece into a ball and flatten with the palm of your hand. Cover flattened balls of dough with a clean kitchen towel and allow to rest for at least 15 minutes (or as much as 2 hours) before proceeding. After the rest period, heat a large pan over medium heat. 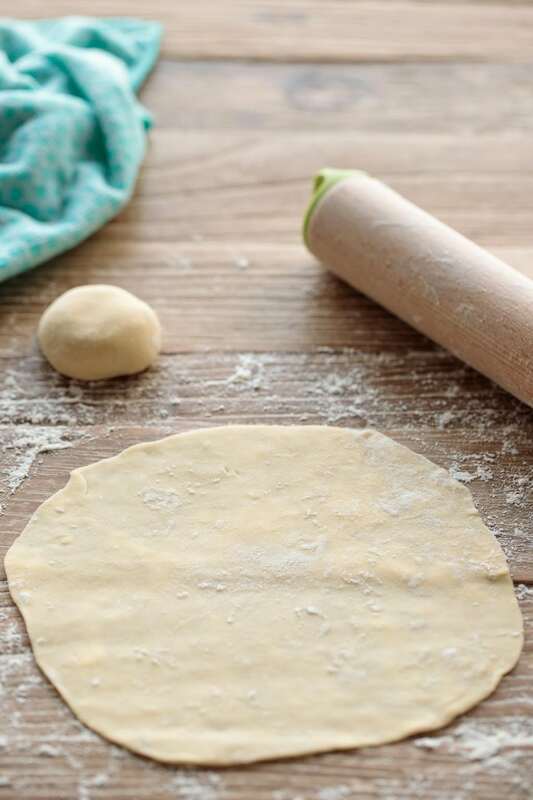 Roll each dough piece into a rough circle, about 6-7 inches in diameter, keep work surface and rolling pin lightly floured. Don’t stack uncooked tortillas on top of each other or they will stick together. When the pan is hot, place one dough circle into the pan and allow to cook about 1 minute or until the bottom surface has a few pale brown spots and the uncooked surface is bubbly. If browning too fast, reduce the heat a bit. If it’s taking longer than a minute to see a few pale golden brown spots on the underside of tortillas, increase the heat a bit. Flip to other side and cook for 15-20 seconds. The tortillas should be nice and soft but have a few small brown spots on the surface. Remove from pan with tongs and stack in a covered container or zippered bag to keep the tortillas soft. Serve warm or allow to cool for later use. When ready to use, place a slightly damp paper towel in the bottom of a microwave-safe container (with a cover) that will hold the stacked tortillas. Microwave uncovered for 15-30 seconds (start with 15) or until warm, then keep covered to hold heat while serving. Store in an airtight container or zippered bag at room temperature for 24 hours or refrigerate for up to 1 week. To freeze, separate tortillas with parchment paper or waxed paper and place in a zippered bag before placing in the freezer. See Café Tips above in post for additional instruction and tips. I had some problems making the tortillas. They didnt turn out right. I followed everything. Hmmm… let me know what kind of problems you had, Rachel, and maybe I could help you troubleshoot. Excellent recipe. !I’ve made them many times. We all love them especially with red beans salad. Yay! Thanks so much, Biyana. BTW, I love your name! After making the tortillas, am I able to leave them out sealed up in a bag or put in the refrigerator like store bought tortillas? If so how long do you think they’d last? Hi Chastity, I like to keep them in the refrigerator. They don’t have any preservatives so they won’t keep as long as store bought tortillas but I’ve kept them for 5-6 days with good results. Can these shells be fried crispy? Yes, they definitely can be fried after cooking them in the pan. Just like the others said: EXCELLENT! I think the key is to let the dough rest and then keep the cooked tortillas under a towel. I hand made them (no mixing bowl) and it came out great! Didn’t spring back to shape as much like others I’ve tried. Also, great tip on heat and how long to have it on for! Thanks so much, Amy! I love making these by hand. And you’re right, allowing the dough to rest is super important!